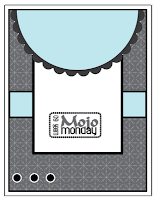 Today's project is for Julee's Mojo Monday sketch. Instead of making a traditional card, I decided to use her sketch to decorate the cover of a cocoa gift packet card. 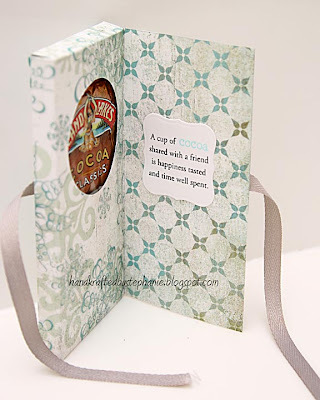 Debbie created a wonderful gift packet for the PTI October release and she generously shared her template here. She filled hers with yummy gourmet hot cocoa packet and presented it so beautifully. When I first saw her project, I saved her template for future use, then I headed off to the grocery store in search of the cocoa packets. I was at a store that I was unfamiliar with, so I had to ask where the hot cocoa was. The guy who helped me to find it said, "hot cocoa, really?". You see, it was still probably 100 degrees outside. Here I am about a month later, finally sitting down to make a few to give as gifts. It has cooled a bit here in Phoenix, and even though it may not be as cold as it is in the north or east, this is pretty much when we start wearing sweatshirts with shorts! Hot cocoa weather? Sure! Thanks for looking! I stamped the mug twice, cut one out and popped it on top of the other. I couldn't find my Liquid Applique, so I tried using brads for the marshmallows. They ended up looking like eyes, so I ended up using crushed velvet (but I still think they look like eyes!). Cardstock: CTMH; Patterned cardstock: Basic Grey Figgy Pudding; Stamps: PTI, MFT ("Warm Wishes"); Ink: CTMH, Memento; Nestabilities ovals, labels one; Heidi Swapp ghost shape snowflake; Doodlebug crushed velvet; Other: crystal stickles, brads, rhinestone, paper piercer; ribbon, foam tape. What a terrific package idea. I really like the color combo and how you were able to incorporate the sketch challenge into something other than a card. That is beautiful! I may have to case you on this, what a great idea! And I have that set too! Love it, well done! AAAAAAAAAAHHH!!!! I am so glad julee posted this on her page today! this is amazing! SO CUTE! 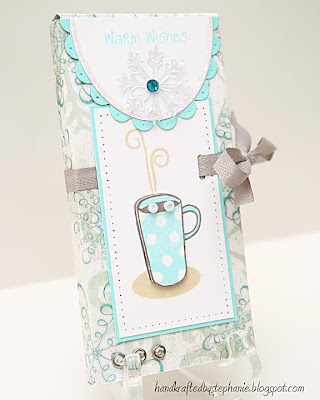 What a lovely way to use the Mojo Monday Sketch and I love how you have decorated it too ! Oh, I can't wait to give this a try! Love your take on the sketch.